These five short bible studies are ideal for junior highs - and a great introduction to small group discussion. These five short bible studies are ideal for junior highs - and a great introduction to small group discussion. The whole book will help you discover who Jesus really is, and what it means to follow him. The pages are fun and action packed - your students will love them! 1. Discovering God - What I think about God! 3. Discovering Jesus - Who is this bloke who has changed the world? 5. Discovering My Response - So if Jesus has done all this for me, what should I do to start following him? Just finished this book with a group of 9-12 year olds who have taken first step an said yes to following Jesus. It was very useful in sorting out the mis conceptions they had, and great to see their growth in understanding the problem of sin and the cost of the rescue. Many are now praying for friends and family! We bought these booklets to help with studies for our 11-14 yr old youth group. The studies are clear and easy to follow. We found that they were good for non-churched kids and new christians but a little simple for those of the group that have more knowledge. I have been using the books with 2 boys, aged 13 and 14, and we have found the questions good starting points for discussion. I have found the book useful for helping the boys to think through the basics of their faith. I have used the Discovering Jesus bible study with young people from Christian and non-Christian backgrounds and found that it has been immensely helpful with both. It is a great foundation for a new group or a group that have not done any bible study before. I would recommend it to anyone! I am using this book with a small group of young teenagers. Each study lasts about 15 minutes and the lessons are good, biblically based and relative to todays young people. 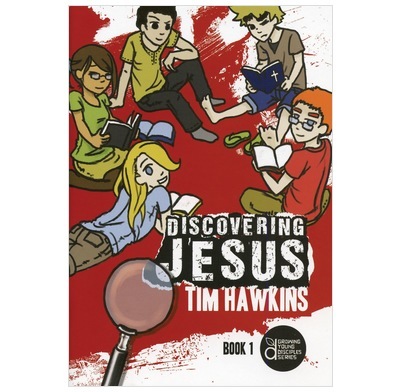 We bought 'Discovering Jesus' by Tim Hawkins for our two children, aged 10 1/2 and 12. We do them together as a family, and our children each have their own book to write down their own answers. Each study chapter takes us about 1/2 an hour, and it often leads to some great discussions. It is a good way of teaching our kids as well as us having some time together as a family. The book is well laid out and easy to follow, with plenty of room for answers to be written down. Each study is very applicable to what our children need to learn, and they enjoy doing them very much. Excellent Bible based group study. I used this at my local church for a group of eight 10 to 14 year olds. Great to get them/me thinking and discussing God's word. Soon to start on the next book in the series.